The Industrial version of the popular SoundEar II Noise Warning Sign is a wall mounted sound level monitor that clearly indicates when staff should reduce the noise levels or fit hearing protection. Unlike many noise monitoring products the SoundEar has been specifically designed to look good. This is clearly important when the unit is to be mounted in a public place. In areas where the noise levels are not always a problem, the SoundEar II Industrial lets you know when it is time to take action. Even in moderately high sound levels a person's hearing changes through the day, making it even more difficult to make a judgment by ear. The occupational noise regulations set the level at which hearing protection is required. A full noise survey should be carried out to assess each worker's exposure. In areas where the sound levels are not always high, it is reasonable to remove hearing protection much of the time. A SoundEar mounted in a suitable position and set to trigger at the correct level gives a clear indication to workers nearby. For more information please visit the Installation page. The Industrial version of the SoundEar II was designed for use in factories and other industrial environments where a warning of high noise levels is needed. When sound levels are often below the action levels (no hearing protection required) and sometimes above, it is unreasonable to expect people to wear hearing protection all the time. However, it can be very difficult to judge when the levels are high enough to require protection. The SoundEar takes away the human perception of noise, giving a clear indication that it is time to reduce the noise levels or fit hearing protection. If machinery is only running intermittently then workers may need a reminder to fit hearing protection when the noise levels are high. The problem is more complex when a number of machines run intermittently, with the possibility of all running at the same time and creating increased noise levels. With one machine running you may still be below the action level, but at what point do you fit hearing protection. The SoundEar II Industrial should be able to guide workers to protect their hearing. The SoundEar II is IP42 rated for use in dusty and damp environments, and so should be fine for use in most factory environments. The SoundEar II Industrial should be mounted in a position where it can be easily seen by people working in the area, at eye level if possible and close to a power outlet. It is important that the Noise Sign is set up to light up when the sound level where people are working reaches a high level. You are not really interested in the sound level at the wall, especially if the machinery and workers are 10ft away. For example, if the sound level close to the machinery reaches 85 dB(A), the sound level at the wall may be only 80 dB(A), so you would set the SoundEar dial to 80 dB(A). The best way to select the trigger level is to measure the noise levels at the positions that people work using a sound level meter and adjust the sign to light up accordingly. 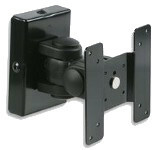 The SoundEar II also has standard 75mm x 75mm VESA mounts - this is the standard for mounting televisions and monitors, so many types of mount are available. Options include a VESA wall mount, for mounting the sign at an angle or in a corner, and an external microphone on an extension able that plugs in to the bottom of the SoundEar II Industrial sign. 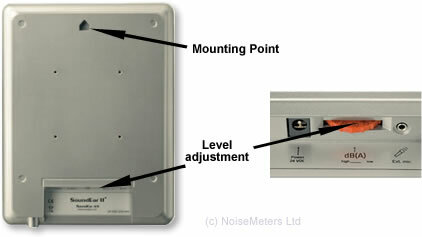 Package includes five SoundEar Industrial Noise Warning Signs along with a hand-held Noise Meter. The overall price is less than buying five individual noise warning signs. Package includes ten SoundEar Industrial Noise Warning Signs along with a hand-held Noise Meter. The overall price is less than buying ten individual noise warning signs.